I’m pleased to report the general availability of PCSWMM 2009 Professional, our flagship software for advanced watershed, stormwater and wastewater modeling. There are a number of cool new features which select clients have been using and providing feedback on over the past 2 years – we’ve bundled them together to create a Professional version and made available to all. The most significant new features include: flood inundation tools, DEM data processing, comprehensive NEXRAD radar-rainfall processing tools, and powerful reporting tools (including enhanced integration of Excel, Access and SQL Server). I’ll briefly highlight each of the tools here. 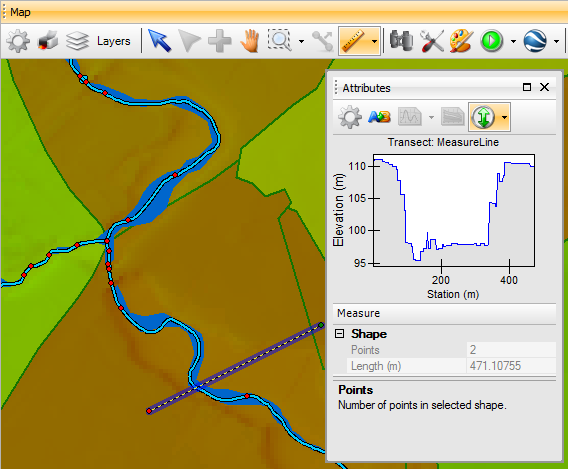 generate channel length-interpolated water surface elevation data and create a flood inundation polygon from a DEM layer. The amazing thing about this approach is that PCSWMM automates the entire process and creates the flood inundation polygons (one per river reach) on-the-fly in less than one hundredth of a second. This means that there is no measureable post-processing – SWMM5 computed time series results are immediately available, and thus you can even animate the flood inundation polygon on-the-fly in PCSWMM and/or in Google Earth. With a single button click, you can create incredibly evocative presentations with animated 3-D rendering of the flooding in Google Earth. In addition, the flood inundation polygon is generated as a shape file, at any time step and/or for the maximum inundation computed, allowing quick export to third party GIS/CAD tools. Another capability of the flood analysis tools is the ability to perform flood impact analysis on a flood vulnerable assets (FVAs) layer, indicating whether the asset will be impacted during the simulation period, the degree and length of impact and the time of occurrence, all based on threshold flooding elevations defined for each asset. 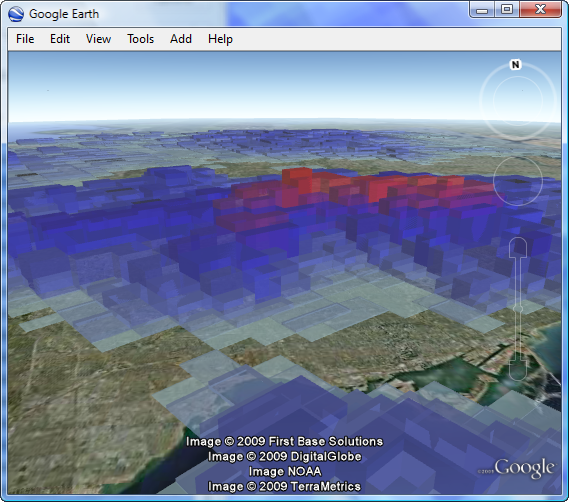 Reports are generated and the FVA layer can be rendered to mark impacted FVAs, and/or animated in either PCSWMM or Google Earth. 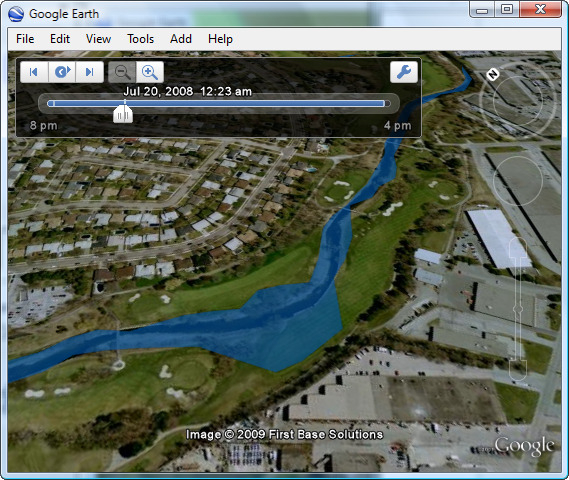 Also new in PCSWMM 2009 professional is the ability to create transect objects directly from DEM. You can either draw cut lines directly in PCSWMM, or open an existing GIS layer containing the cut lines. Left and right overbank stations can be identified, and the new transects can be automatically assigned to their intersecting natural channels (SWMM5 irregular conduits). And when you have more than one transect intersecting a conduit, the Transect Creator tool will average the transects to create a single representative transect for each irregular conduit. But perhaps the best new feature of this tool is the ability for PCSWMM to automatically discretize your drainage network (creating irregular conduits and junctions) based on the transect cut line locations. To provide quick slope and ground profile information, the Measure distance tool now automatically displays the DEM profile in a plot, and allows you to directly copy the station/elevation data to the clipboard for even more flexibility. Finally, DEMs can be used to populate nodes (or any point layer) with surface elevation data. And, as mentioned above, DEMs can be used in conjunction with the new Flood Analysis tool to create animated or static 2-D flood inundation polygons from EPA SWMM5 results in record time. Combined with SWMM5’s ability to perform dynamic wave routing for analysis of backwater effects, bifurcating streams, inlet and outlet controlled culverts, bridges and other encroachments, not to mention urban drainage infrastructure, you have a powerful and very fast method for flood analysis. Generate rainfall input hyetographs for each subcatchment in the model using PCSWMM’s topological operators (area-weighting). While the above seems like a lot of computations, PCSWMM automates all of this and the entire process is completed in just a few minutes for a single event. Remember this was originally developed to run in real-time, so even though it is automated to a high degree (all of the above is performed with three button clicks) and optimized to be extremely computationally efficient, you have a fine level of control over the setup of each step, and copious reports and intermediate time series are generated for a post-run analysis of the generated rainfall time series. For large scale bulk processing of data, you have the option of writing time series to a SQL server database, and the time series generation can utilize the PCSWMM computational grid (i.e. leverage multiple networked computers to create a virtual supercomputer). To provide an illustration of the scalability of this tool, we have a client processing 12 years of radar data (at a 5 minute time step) covering an area of 36,000 square kilometers (14,000 sq. miles), creating time series for each of 36,000 cells in a 1km x 1km grid, generating 45 billion data-points. We pride ourselves on the scalability of our software, but I'll admit that wowed even me. Please don’t let the above scare you though - most applications are for single events and small spatial extents, with applications in watershed modeling, as well as sanitary sewer RDII studies and system wide stormwater models. PCSWMM Professional includes a comprehensive set of data post processing in the new Reporting tool. Hundreds of thematic maps, graphs and profiles can be published automatically from PCSWMM after a SWMM run (or at any time by clicking a Publish Now button), and SWMM tabular results can be queried (filtered) and pushed directly to Excel (2003/2007) for automatic post-run analysis with macros or formulas. In addition, Access or SQL Server databases can be automatically updated with select SWMM5 time series and statistical results. One of the cool applications of this tool is the posting of results to a web server for browser based reporting, complete with Google Earth and/or Google Maps integration. This last feature is impressively effective means of presenting model results to clients/stakeholders. Much more is coming for our PCSWMM 2010 Professional version – I will be giving you a sneek peak at some of the things we are working on in a subsequent post. As always, if you would like to know more about the features of PCSWMM 2009 Professional and how they can be put to work for you, please contact us to discuss or book yourself in for a live webinar.